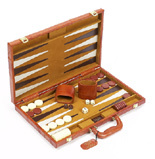 This is a brown and leatherette backgammon set with a beautiful tan color stip. The set comes with 1.25” brown and ivory game pieces with matching dice cups and 2 sets of color dice and doubling dice. 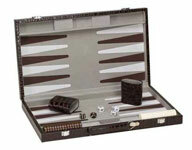 This backgammon set comes in the three sizes shown below. BG406-3028M. Deluxe, Black Leatherette Backgammon Set. This handsome set includes a black leatherette style case with a smooth playing field board of grey, black and red. The set includes dice, chips, cups, and doubling cube. All sizes available for this set are shown below. You and your family will enjoy and admire this fabulous black and red leatherette set. 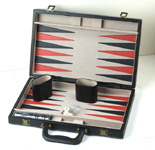 A perfect backgammon set choice that includes cups, dice, chips, and doubling cube. All sizes for this backgammon set are shown below. This is a fabulous and durable brown leatherette attaché backgammon set , that features a felted playing field and solid brass hardware.All game pieces are included. The price for this backgammon set is displayed above. The set measures 18" x 10.5" x 2.12". This fabulous 18” red Leatherette backgammon set features a black and red velour inlay gaming board, ivory game pieces, two matching dice cups, 2 sets of color dice and doubling dice. The set is available also in a 15" set. BG404-2113. Tournament Leatherette Backgammon Set. 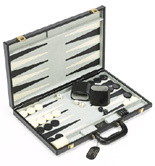 This magnificent backgammon set features a tournament size perfect for the serious backgammon player. Inside the beautiful black leatherette attaché case is a felted playing field with leatherette points. The set includes two matching color dice cups, four dice, chips, and doublers. The set measures 21” x 13”x 2 ½” (closed). This beautiful and unique backgammon board comes with an attaché case patched leather case with durable brass latches. The inside is covered in suede, the blots and chips are burgundy and white. The set includes all accessories, and measures 18” inches. BG403-2025. Deluxe Black Genuine Leather Backgammon Set. This handsome 18” backgammon set features a stylish black genuine leather briefcase style case with solid brass latches, and a high suede grey and black playing field. The set includes dice, chips and cups. A perfect item for you and your family to enjoy! BG405-2026. Premium, Italian Walnut & Leather Tournament Backgammon Set. This Italian handsome backgammon set is made out of the finest materials. You will enjoy the intricately crafted case made out of walnut with English leather exterior and the beautiful brass latch 24KT gold pleated with lock and key. This is a luxurious tournament set and an excellent item for those who demand attention to detail. The set measures 26”x 20 ½” inches.